In July and September 2016, a trial excavation was conducted near Ben Gurion Airport (Permit No. A-7758; map ref. 188023/655884). 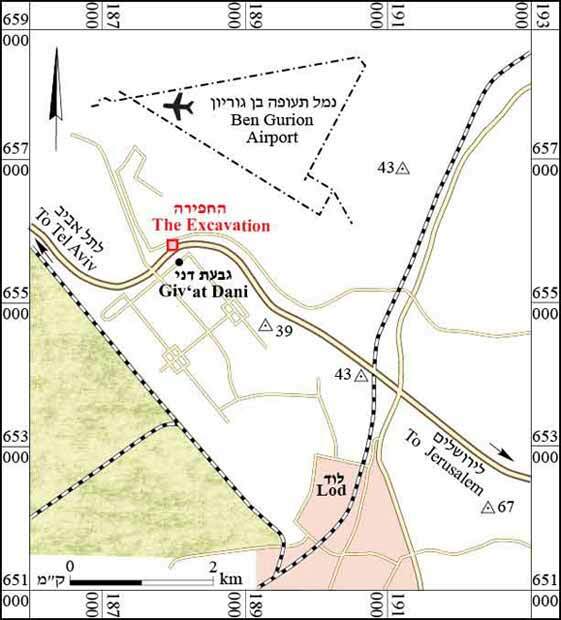 The excavation, on behalf of the Israel Antiquities Authority, was directed by G. Itach, with the assistance of Y. Amrani and E. Bachar (administration), M. Kahan (surveying and drafting), Y. Agmon and D. Shahar (photography and assistance with the excavation), M. Landau (Israel Airports Authority), V. Eshed and Y. Nagar (physical anthropology), O. Barzilay (flint), A. Dagot and H. Ben-Ari (GPS), N. Zak (plans), A. Gorzalczany, P. Gendelman and E.C.M. van den Brink (scientific consultation), A. ʽAzab (Central District Archaeologist) and D. Ben-Ami (Central Region Archaeologist). In the late 1990s, a round stone-built installation was exposed c. 5 m below the surface during drainage work in Nahal Ayalon (Fig. 1). The installation was identified by R. Mordechai during an inspection and documented by O. Shmueli (Figs. 2, 3). Chalcolithic pottery sherds were discovered alongside it. The suggestion was made that the installation, located north of Givʽat Dani, a ruin where architectural from the Mamluk and Ottoman periods were discovered (Lazar 1999) and that was not excavated, be identified as a well (van den Brink, Golan and Shemueli 2001:33). 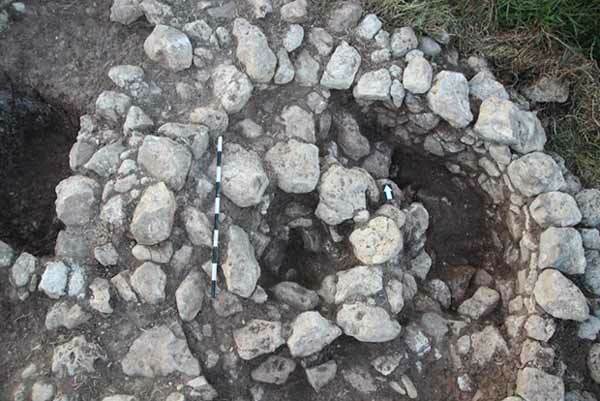 In recent years, two round installations built of stone that were dated to the Chalcolithic period were excavated at Tel Yehud, c. 4 km to the north and were identified too by the excavators as wells (Govrin 2015:14; Itach 2016). 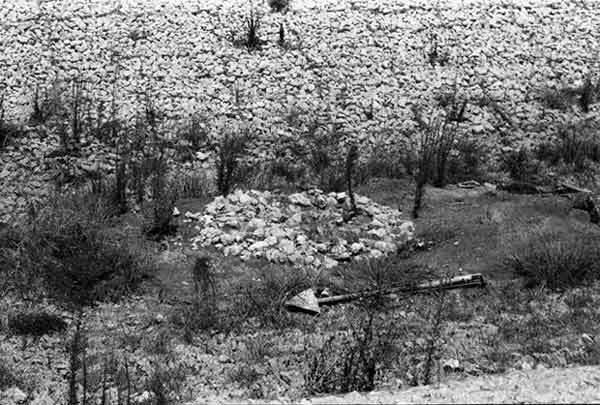 Two similar installations were excavated in Tel Aviv near the Yarqon River (Kaplan 1972:166–167; van den Brink 2011). The current excavation was therefore intended to examine whether this installation was also a well and whether it dated to the Chalcolithic period. The installation had a curvilinear outer wall (W100; outer diam. 3.7 m, inner diam. 2.5 m, width 0.7 m; Figs. 4–6) built of two rows of partly dressed fieldstones and a small-stone core. Next to the western inner side of the installation was a curvilinear inner wall built of one row of fieldstones (W103; outer diam. 1.4 m, inner diam. 0.75 m, width 0.5 m). An accumulation of brown soil and a few sherds were unearthed inside the small circle (L102). A bedding of small and medium-sized fieldstones (L101) was exposed between the stone circles. 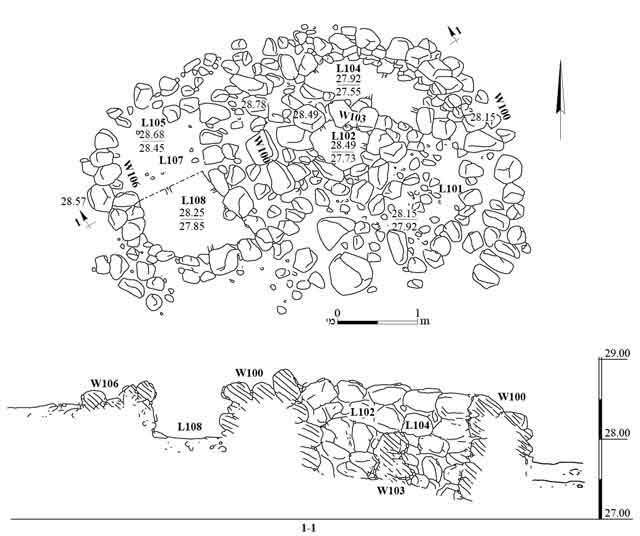 A trial trench, excavated in the northern part of the installation revealed that this was deliberate fill, a kind of bedding for the small circle of stones, that was irregular in shape (Fig. 7) and may have served as a floor (L104). Several pottery sherds, flint items and bones were found in the trench, which exposed up to eight courses of the inner face of W100. After cleaning and dismantling the collapse, a stone heap was exposed west of W100, revealing a wall (W106; width 0.4 m, height 0.2 m) built of two rows of stones; it adjoined the southern side of W100. Apparently, the wall was semicircular and abutted W100 from the north. A section of W106 (L108) was excavated between W100 and W106 in soil containing numerous pottery sherds. Just one course of W106, and five courses of W100 were revealed in the outer western face. contains many inclusions and is poorly fired. The few diagnostic fragments retrieved were of holemouths and V-shaped bowls. Although no fragments of churns, cornets or incense-burners were discovered—characteristic of the Ghassulian culture and particularly prevalent at nearby Tel Yehud—it nevertheless seems that the assemblage can be dated, with caution, to the Chalcolithic period. The stone objects uncovered include two fragments of a basalt incense-burner, a base of a bowl and two fragments of grinding stones. A flint blade and small fragments of bones, probably human, were also discovered (in L104). The plan of the installation differs from those excavated in Yehud in recent years, and therefore, it cannot be identified as a well. However, it seems to have been used during the Late Chalcolithic period. Similar structures, identified as funerary buildings, were excavated near Kibbutz Palmahim (Gorzalczany 2006) and in Shiqmim in the Negev (Levy and Alon 1979). 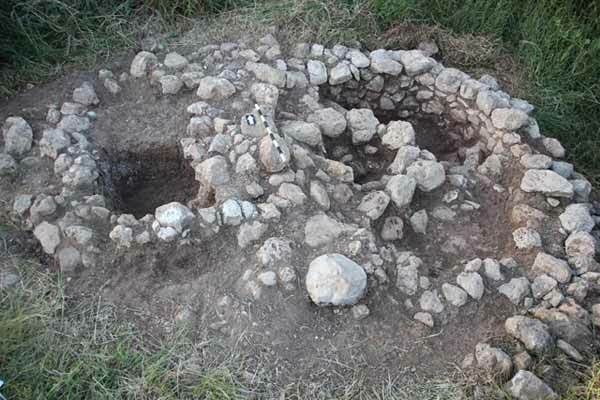 We suggest that the apparent date of the installation, its architectural plan, the meager fragments of human bones and the parallels presented diagnostic that this is a funerary structure from the Chalcolithic period. Evidence of extensive human activity during the Chalcolithic period has been uncovered at Tel Yehud, c. 4 km to the north (Milevski 2008; Jakoel 2014; Jakoel and van den Brink 2014; Govrin 2015; Itach 2016). Tombs from this period have not yet been discovered near the tell. 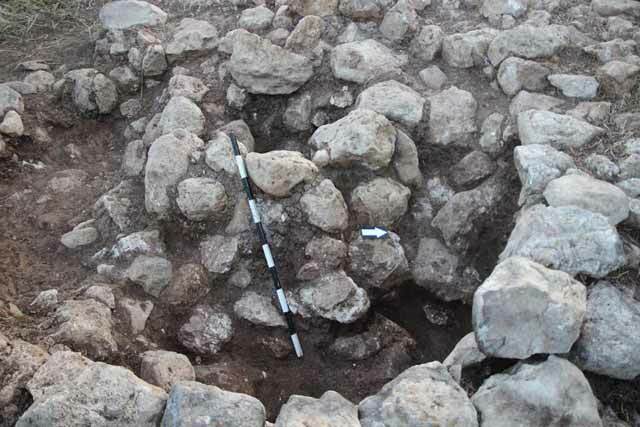 The structure exposed in the excavation may have belonged to the burial ground of the Chalcolithic settlement in Yehud, c. 4 km south. Gorzalczany A. 2006. A Cemetery from the Chalcolithic Period at Palmahim–North. Qadmoniot 132:87–94 (Hebrew). Govrin Y. 2015. Excavations at Yehud: The 2008–2009 Seasons. NGSBA 3:7–160. Itach G. 2016. Tel Yehud. HA-ESI 128. Jakoel E. 2014. Tel Yehud, Biakovsky Street. HA-ESI 126. Jakoel E. and van den Brink E.C.M. 2014. Tel Yehud, Lugano Project. HA-ESI 126. Kaplan H. 1972. Ha-Aretz Museum Yearbook 14. Pp. 165–167 (Hebrew). Lazar D. 1999. A Mamluk and Ottoman Settlement at Giv‘at Dani in the Ayalon Valley. ‘Atiqot 38:127*– 136* (Hebrew; English summary, pp. 231–232). Levy T.E. and Alon D. 1979. A Preliminary Note on the Chalcolithic Cemeteries at Shiqmim, Northern Negev. JIPS 16:114–117. Milevski I. 2008. Yehud. HA-ESI 120.
van den Brink E.C.M. 2011. Tel Aviv, Namir Road. HA-ESI 123.
van den Brink E.C.M., Golan S. and Shemueli O. 2001. A Note on the Archaeological Investigations at Yehud and Some Chalcolithic Finds. ‘Atiqot 42:25–34. 2. 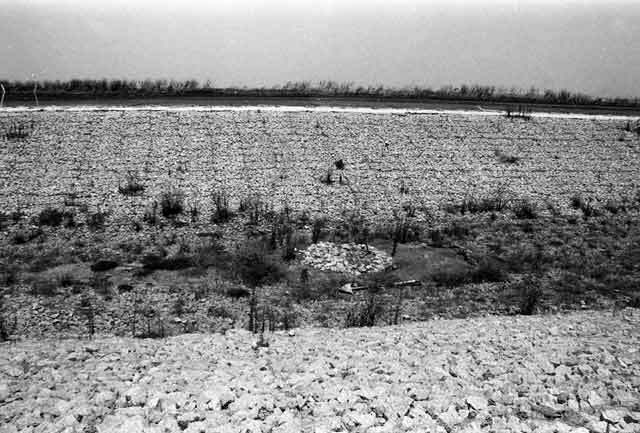 The artificial channel and the installation at the bottom, as documented in the late 1990s. 3. The installation, as documented in the late 1990s. 5. The installation, looking north. 6. The center of the installation, view from above. 7. The inner circle of stones, looking west.